A brockage is an error coin. One side (most of the times the obverse) is normal, but the other side instead of the reverse displays the obverse again, incuse or in negative. 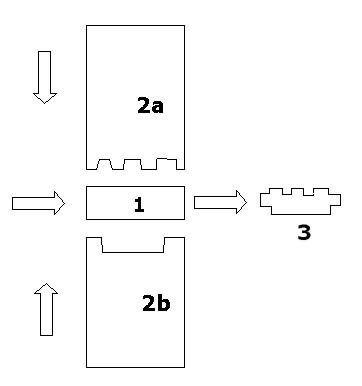 In just a few words, a coin is produced by inserting a piece of metal, called blank (1) between two dies (2a,b). One of the dies is fixed (in a type of anvil setup), the other is mobile, held by a worker with tongues. With his other hand the worker (or another worker) applies a hammer blow to the mobile die and the engravings of the dies are transferred in positive to the blank resulting in a coin (3). Another blank is positioned and struck, and so on. In some rare occasions, the coin can adhere to one of the dies and remain undetected for a while, because the process was carried out at a very fast pace. 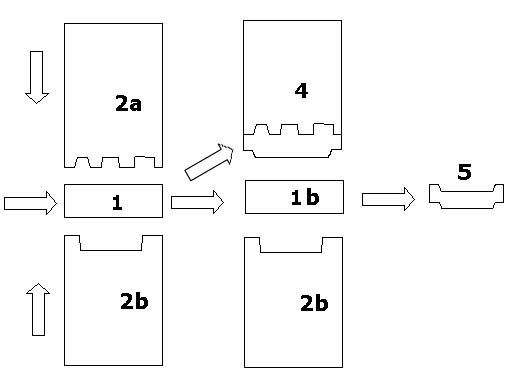 Following the drawing below, a new blank (1b) will be struck by the normal die (2b) and by the die + coin combo (4) resulting in a brockage (5). Photographs of some attractive brockages follow are provided below. Reverse brockages exist but are rare.